The beach is nice enough, but anyone who has ever arrived by plane knows that the Caribbean islands look good from above. 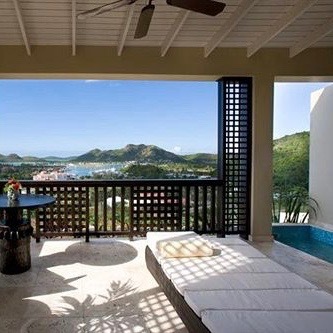 And the hoteliers behind Sugar Ridge seem to know it, too, for instead of plunking their resort as close to the waterline as possible, they’ve sprinkled a smallish collection of vista-rich buildings, each with just four guest rooms, lightly into the hills above Antigua’s west coast. For all the advantages of a hotel set right on the beach, it’s hard to match the appeal of a room with a breezy veranda or plunge pool set high in the wooded hills, the turquoise water below somehow even more crystalline when viewed at an elevation. It helps, too, that the rooms are rather lavish. 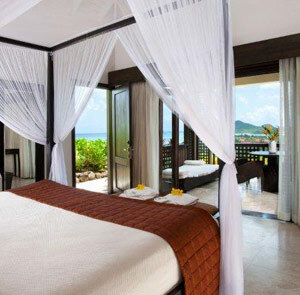 Spacious and uncluttered, they’re centered around four-poster king beds whose muslin draping paradoxically makes the breezes feel a little breezier, the sunlight a little sunnier when you’re lounging about in bed. Marble bathrooms and furnished patios or decks come standard, while the rooms with private pools make the relative distance from shore especially inconsequential. In reality, it’s only a short shuttle-ride to the beaches anyway, and the cheerily named Jolly Harbor Marina, a jumping-off point for boating, diving and fishing trips, is just across the road. Still, Sugar Ridge is something of a destination unto itself. Carmichael’s, one of the hotel’s two restaurants, is among the best in town, while the hotel’s more casual Sugar Club is a genuine hangout for locals, expats and travelers alike. 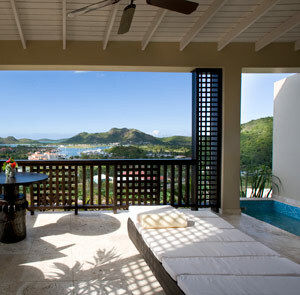 The atmosphere, as ever in the Caribbean, is pretty casual, but if you wanted to get a little fancied up for a night at Carmichael’s, just for fun, the hotel’s sprawling Aveda Concept Spa, which adds a hair salon and manicure and pedicure stations to the usual mix of pools and treatment facilities, should more than suffice.